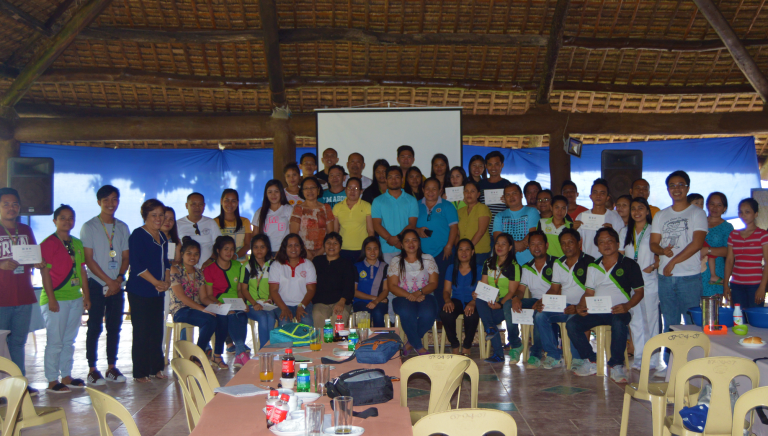 The resource persons and participants during the seminar-workshop for food handlers. LA LIBERTAD, NEGROS ORIENTAL (Feb. 2, 2018) – About 50 participants coming from food manufacturing firms, students and local government unit of La Libertad attended the one-day seminar-workshop on basic food safety for food handlers at La Limar Beach Resort in La Libertad, Negros Oriental. Organized by the Department of Science and Technology-Negros Oriental Provincial S&T Center (DOST NegOr PSTC ), the seminar aims to equip local food handlers the basic food safety they need since they are on the front line in food preparation. The activity is in cooperation with the Negros Oriental Food Safety Team (NOFST) led by Mrs. Gemma B. Kitane of Silliman University (SU). Ms. Geraldine Quiñones of Negros Oriental State University and Ms. Ruth Ann Entea (SU) also served as the resource persons during the seminar. During the short but very informative workshop, Mrs. Kitane explained on introduction to food safety, food hygiene, current good manufacturing practices, legal framework and the emphasis of farm-to-fork principle. Also discussed were topics on food hazards, personal hygiene and prevention of cross-contamination in food. The speakers also focused on understanding the legal basis of food safety, traceability, food allergen, shelf life of products, retention of product sample and recall program. "The purposeof this activity is to widen our learning in food safety and preparation. Our work is very critical since we are the direct link from food to consumers. Let us all try to be open-minded and incorporate the useful recommendations advised to us," Mrs. Kitane also added.